Sloto Cash as a casino name gives you a bit of an insight into what this platform specialises in. However, despite it having a hefty enough collection of slot games, it also provides other options, such as table games and poker. The casino has been online since 2007, so it has over a decade of experience with providing gaming services to players. It holds a gambling licence from the jurisdiction of Curaçao, meaning that all gameplay and functions on the site are secure and fair. As well as this, you’ll find that the casino is very easy to navigate through, with a clever layout and appealing design. 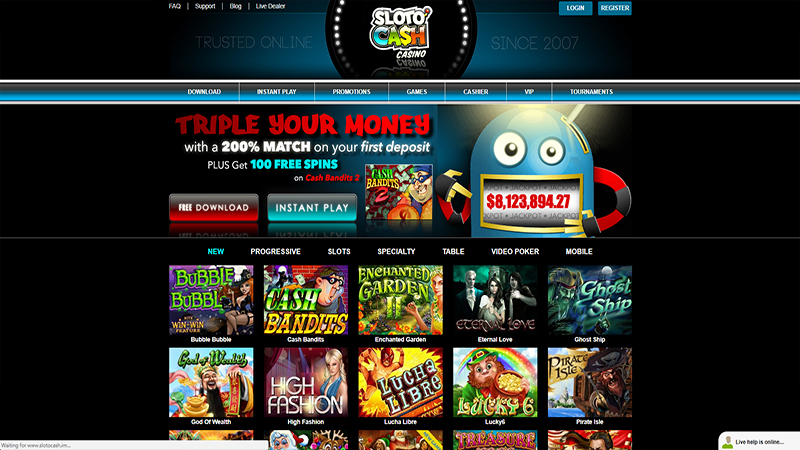 Sloto Cash is entirely a Real Time Gaming casino. Therefore, it only hosts games from this single developer for players to access. While this is not especially a bad thing on the whole, it does mean that there’s a smaller range of titles to play than what can be found at many other online casinos. However, it also means that because RTG’s games are available as downloadable options, that the casino game lobby is available in both instant play and download versions. There’s a great choice of slot games available to play from RTG at Sloto Cash, but then again, the casino is named after such. In the lobby, you’ll find titles such as Double Ya Luck, Treasure Tree, Wild Wizards, Crystal Waters and Lucha Libre. While this is great in terms of amount of games, RTG isn’t specifically known for having the greatest games in terms of graphics and overall gameplay. 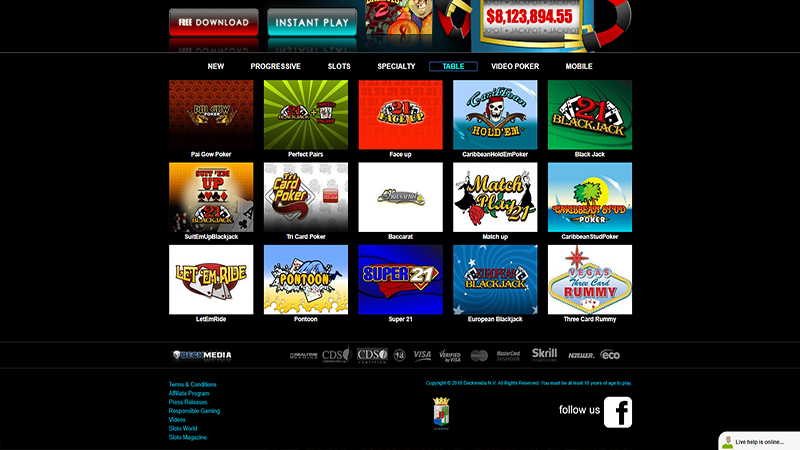 However, there is a total of five progressive jackpot games alongside these standard slots, including Megasaur. In the ‘Table’ category, players will be able to access several variations of poker and blackjack. However, if it’s roulette that you’re looking for, you’ll need to navigate your way to the ‘Speciality’ section. This area also houses games of keno and craps. RTG is quite well-known for its dedication to creating multiple video poker games though, so you’ll find a vast amount of these on hand at Sloto Cash casino. They include options like Bonus Deuces Wild and Double Jackpot Poker. After you sign up to the Sloto Cash casino site, you’ll also be able to benefit from some special offers. These do enhance your time as a player at the site, starting with the welcome bonus that is available. This welcome offer actually extends across your first five deposits at the site, as long as you use the codes SLOTO1MATCH, SLOTO2MATCH and so on with each one. On your first deposit, you’ll receive a 200% bonus as well as 100 freespins. 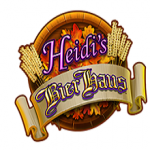 These freespins are usable on the game known as Cash Bandits 2. Then, your second, third and fourth deposits come with bonuses of 100% and 50 freespins each. Finally, on your fifth deposit there, you’ll get a bonus of 177% and another 50 freespins. Continuing on with your gaming journey at Sloto Cash, you’ll be able to receive promotional offers from the casino. These incorporate bonuses and rewards for specifically playing blackjack or poker games, and you’ll also start collecting Comp Points as soon as you make your first wager at the site. When you reach 100 of these, you can exchange them for some bonus money. When you then add the daily promotions into this, Sloto Cash casino is actually a very appealing and rewarding platform to join. Whenever you’re ready to make a deposit into your casino account, you can make use of one of several accepted payment methods. There’s the regular Visa, MasterCard and American Express credit and debit cards. 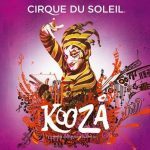 Alternatively, you have the option of utilising Skrill or Neteller eWallets. Other payment methods include ecoPayz, Bitcoin and Bank Wire Transfer. Or, there’s also the possibility of a Direct Money transfer too. You can’t utilise any of the card options to make a withdrawal, but the remainder of these banking options are possible for such. If you find yourself at a time of needing help while at Sloto’ Cash casino, then don’t worry. There are various support options available to you to utilise. A few FAQs are answered in various sections of the site, but there’s also a support team on hand 24/7. Therefore, you can reach them via Live Chat or email. Telephone support is also available, with both a toll free and a regular number on display on the website. The Sloto Cash casino is very much appealing from the get-go. While it doesn’t host an incredibly large amount of games, the ones that are available are decent enough. The casino’s promotions are quite welcoming too, while the possibility of receiving assistance whenever it’s needed is a great perk. Play at Sloto Cash Casino. USA Players Welcome!